Culberson County-Allamoore ISD has received a grant for $140,000.00 per year for seven years. This grant is only awarded to 10 school districts a year in Texas. We are very excited for our students and staff. 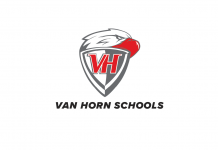 This grant aligns with “The Van Horn Vision.” The vision is for all seniors to graduate with an Associate’s Degree and at least one STEM Endorsement. The vision has moved from concept to action this year. We have approximately 10% of our Juniors and approximately 26% of our Sophomores that could reach this vision. Currently, our school has over 75% of our students living in low socioeconomic status. One source shows the income per capita in Van Horn to be $19,251, which is 31% lower than the Texas average and 35% lower than the national average. The median household income is $34,583, which is 37% lower than the Texas average and 37% lower than the national average. We realize that either we do school the same way and stay the same or we change the way we do things to better ourselves. If we want different results than what we’re getting, we have to try different approaches. This is about a better way of life for our children. To be successful in our vision, we brought in AVID, Project Lead The Way, and GEAR UP. AVID challenges belief systems and practices that keep students from achieving their full potential. AVID opens access while providing students with the tools to be successful. Despite the societal and socioeconomic challenges many AVID students face, they have outperformed national averages in key college and career success measures. There is no magic wand to make a student successful in college. We have traditionally just dumped students into college classes and hoped for the best. It has become such a problem, that many colleges are using AVID to try to keep students from failing and dropping out of college. Our nation’s schools are full of students who possess a desire to go to college and the willingness to work hard, but many of them do not truly have the opportunity to be college-ready. We have begun this preparation in the 6th grade and continues through 12th grade. For one period a day, students receive the additional academic, social, and emotional support that will help them succeed in more rigorous courses. We have not forgotten the elementary students. This year we introduced AVID in grades 6-12, but there are strategies for elementary students we are bringing in this year and next year. Project Lead The Way (PLTW) has been introduced this year. “PLTW Launch” is for the PreK-5 grade students. You already know this, but our Kindergarten – 5th-grade students are great designers and innovators. The elementary program has 28 interdisciplinary modules that empower students to adopt a design thinking mindset. These are hands-on activities in computer science, engineering, and biomedical science. The goal is for them to become creative and collaborative problem solvers not afraid to take on any challenge. “PLTW Gateway” is for the 6-8 grades. It has 10 units that are hands-on programs designed to boost classroom engagement, excitement, collaboration, deep comprehension, and inspire “aha moments.” PLTW Gateway activities are in computer science, engineering, and biomedical science. “PLTW Engineering” has been introduced to the 9-12 grades. From launching spacecraft to delivering safe, clean water, engineers step forward to solving real-world challenges. We have incorporated our Drone program into PLTW Engineering in several classes. We will be introducing a way to get an Associate’s Degree in Robotics. In the near future, we will introduce PLTW Biomedical Science for the 9-12 grades. The Gaining Early Awareness and Readiness for Undergraduate Programs (GEAR UP) State Grant is a seven-year federal initiative designed to increase early college awareness, readiness, and success for low-income and historically underrepresented students. The grant follows a cohort of students starting in 7th grade through their first year of postsecondary education. Nationally, GEAR UP outcomes have shown positive student gains for participating students. Students graduate from high school at a higher rate than their peers – regardless of ethnicity or income – and attend college at a higher rate. For more information about the federal grant program, visit the Department of Education’s GEAR UP homepage. In an effort to increase college awareness, readiness, and success, Texas GEAR UP recommends its free resources- available to any student, parent, educator, or district. Go to Texas GEAR UP. This webpage hosts a variety of information for multiple audiences: students, parents/family, and educators. The Student Hub has college preparation tools for students (such as researching colleges, exploring career opportunities, and deciding which classes to take in high school). The Parent Spot has guides for parents to support their teens through the college process. This includes topics such as being an advocate for students in applying and paying for college. The Educators’ Lounge has TEKS-aligned lesson plans and other tools to get students excited about and prepared for college.